Your support can mean the world to a woman who has chosen life for her baby at Life Centers. The center in your area connects you with a woman in your community, and you host the event at your church or at the center with gifts to bless the mother and her child. Select a coordinator to serve as the hostess and to organize the event. Is there more than one way to host this event? Absolutely! Be creative you may decide to have an afternoon party or maybe a month long gift-collection. Choose a time and place that would suit your congregation. How do I promote our baby shower? Begin one to two months before the event. Be sure to announce the shower in the church bulletin and from the pulpit. Use e-mail and church newsletters where available. Posters and flyers are good also. Reminders may be given in Sunday School classes and in the nursery. How do we communicate the ministry of Alpha’s Glory to our congregation? A brochure explaining the services offered; the statement of faith and the commitment of care is available from the Alpha’s Glory CPC’s office. A video, a guest speaker and a table top display are available upon request. What types of baby things do you need? The items that are difficult to keep on hand because of the high demand are the following: diapers, wipes, toiletries (powder, lotion, shampoo, bath, and ointment), bibs, pacifiers, new bottles, jars of baby food and formula. Yes. We recycle baby clothes (newborn to 2T) that are gently used and may be given as a gift. We also take furnishings such as strollers, bassinettes, walkers, swings, etc. Are there any baby items that you do not accept? Yes. By law we may not give expired car seats, used baby bottles or cribs. We have no way of fixing baby items, so we may not take broken or non- working items. 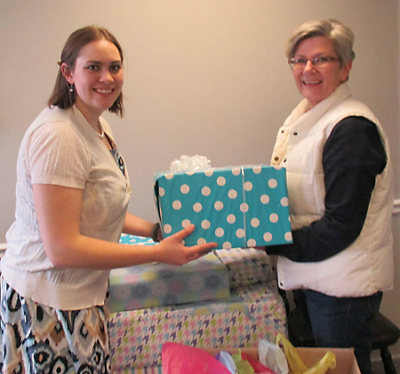 How often should our church or organization hold a baby shower for the Center? Once a year would be a big help to the Center. You may want to choose a certain time of the year and make it an annual event for your church or organization.